TCP Proxy: This option terminates client TCP connections at the Virtual Service. A new TCP connection will then be used for the connection between the Service Engine and the server. This type is required in order to apply an HTTP application profile to the virtual service. See TCP Proxy. 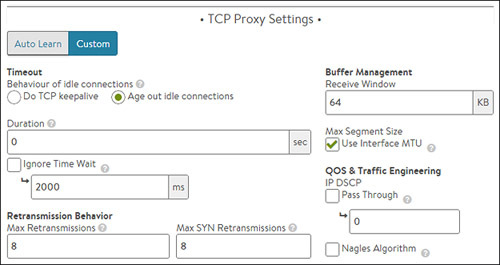 TCP Fast Path: This option will allow a client to connect directly with the server through Avi Vantage. This minimizes the workload for Avi Vantage, but also reduces security, visibility, acceleration, and application availability. See TCP Fast Path. UDP Fast Path: This option enables UDP for the Virtual Service. See UDP Fast Path.